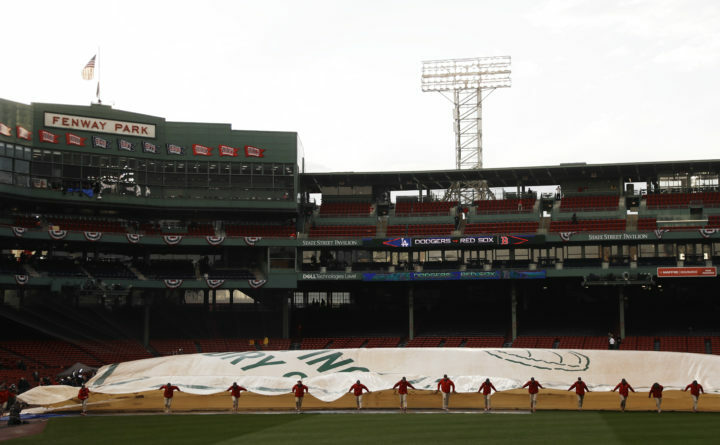 Groundskeepers remove the tarp over the infield at Fenway Park following a rain storm before Game 1 of the World Series baseball game between the Boston Red Sox and Los Angeles Dodgers in Boston, Oct. 23, 2018. There were no municipal bonds sold for stadiums during the first quarter. I was so disturbed by this news that I consulted Bob Klapisch, who during nearly four decades as a sportswriter has been to every major league ballpark. Based on how he sees it, investors waiting for higher-yielding stadium bonds better look beyond baseball, at least for now. Klapisch told me he didn’t think we’d see the number of teams expand to 32 from 30 any time soon because “the decline in attendance has a lot of folks spooked.” In 2018, Major League Baseball attendance dropped to 69.7 million from 72.7 million in 2017, the first time it has fallen under 70 million since the 67.6 million of 2003. Then of course, with baseball, nostalgia may play a role. In Klapisch’s new book, “Inside the Empire,” an analysis of the new-style New York Yankees co-written with Paul Solotaroff (published by Houghton Mifflin Harcourt), there’s a great description of Fenway Park, home of the Red Sox, the Yankees archrivals and 2018 World Series champs: “The ballpark opened in 1912, when humans were apparently the height of Shetland ponies. You enter the visitors clubhouse — and you feel like you’re in colonial Williamsburg,” they write. “All in all, Fenway is a marvelous place — for a wrecking ball.” But will it ever be replaced? Probably not in our lifetime, Klapisch replied. “That might be something for the next generation. The rabid fan base now just will not let go,” much as the owners might prefer a new stadium with modern amenities, he said. That’s one reason teams so often relocate, which could mean some new stadiums even if the number of ball clubs stays the same. At the top of Klapisch’s list: Las Vegas, which last year sold almost $650 million in bonds to finance a new football stadium for the Oakland Raiders, and Montreal, which actually had a major league team, the Expos, from 1969 to 2004. And, of course, minor league baseball has “exploded,” Klapisch said, because it’s affordable. A family of four can still go to the ballpark for about $100. So there’s probably a few more minor league financings in our future. Since 2000, municipalities have sold $28 billion in municipal bonds to help finance stadiums, including those for colleges, according to Refinitiv. They haven’t sold any yet this year, but if I had to bet, I’d say it’s because $1.7 billion was issued in 2018 (for a range from minor league ballparks to that new football stadium in Vegas). That was a four-year high, which argues against any retreat when it comes to borrowing for sports teams. So if you’re waiting to buy their bonds, it may be a little while. But they’ll be back. Joe Mysak is a municipal market columnist who writes for Bloomberg Opinion. The observations he makes are his own and are not intended as investment advice.